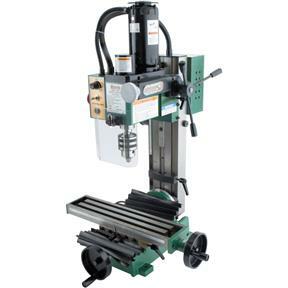 Now here is a Mini Milling Machine that has more features than some Mill/Drills and is affordable for everyone! This little brute will handle any kind of job up to 1/2" drilling, 1/2" end mills and 1" facing. No belt changes necessary! 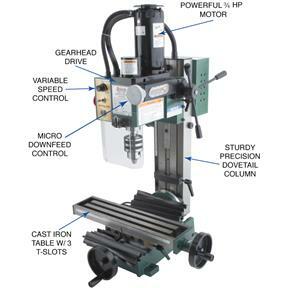 The variable speed control and gear drive saves you time and hassle—Truly a remarkable machine. Max. 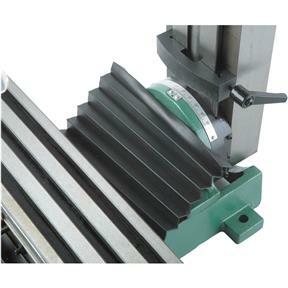 distance spindle to table: 11-1/2"
Table size: 3-5/8" x 15-3/4"
Approximate shipping weight: 149 lbs. Had it for a month now and put it thru its paces... for the avg home hobby machinist or fabricator this machine will get the job done. Its not a Bridgeport so as long as you keep that in mind and use accordingly you will have a smile on your face every time you find an excuse to fire it up.. it may be of China origin. But this thing is not cheap junk in any way. You will not get a better bang for your buck. Ive used it on tool steel and it did just fine. I am very happy with my new Grizzly mini mill. I immediately installed a belt drive and air lift conversion kits which I believe are both a must. I bought this a month ago. I have no experience running a mill so I appreciated the good instructions in the manual. 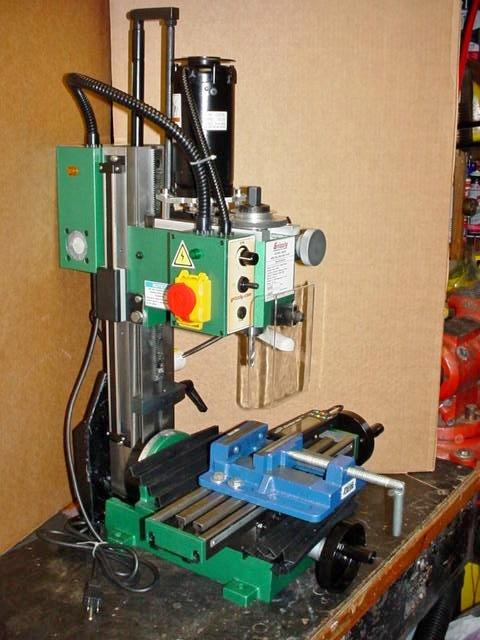 I have been pleased with my purchase and the ease of operation of the machine itself. This mill is everything I had thought it to be after having read countless reviews on-line. Upon receiving, it was immediately disassembled & cleaned (very important), then carefully inspected, re-adjusted, re-lubed, and run through its bearing break-in procedure, all without incident. Confident there would be no surprises, an air lift kit, belt drive conversion, Z-axis DRO, and a custom stiffening plate to increase column rigidity, were then added. Could not be happier with its performance. BTW, the machine took only a 3 or 4 days to arrive, and came damage-free in a wooden box. I'll be back to buy a Grizzly lathe next. the mill was delivered to my house on a pallet. complete with all accessories. very heavy to get up on the bench top. Cleaned up the shipping cosmo. broke in the spindle per instructions. so far it functions great. would highly recommend. For small projects this Mill doesnt do a bad job. Stirrped gears out the second time i used it but Grzzly was fast with the warranty parts. This is a good mill for a great price! I wish I would have ordered a vice with it though, or even better, if one came with it! It's useless to me without a vice so I'm going to buy one soon. Overall this mini mill is fine. As might be expected on a piece of machinery shipped from overseas, the machine was covered in cosmoline. To remove the gunk completely requires disassembly of the mill. By definition a mill is supposed to be a relatively accurate tool. This mill comes shipped with a chuck with an acceptable run out of .006" (per tech support). 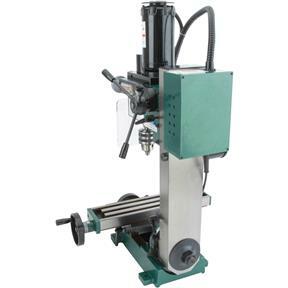 That tolerance or lack of it is fine for rough drilling but not precision drilling. If you are willing to abandon this component and use quality collets instead, you will be good to go. So this would be a good machine for 80% lowers? I'm a knife maker by trade, and a milling machine in some capacity is not only needed, but it also opens a lot of options. 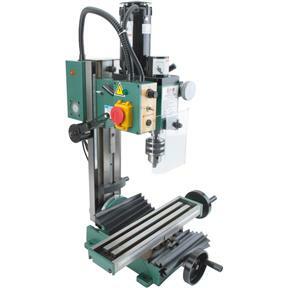 This machine is simple in it's construction, and it's priced just right. I've only had the machine for a month so far, but it has performed every task I've thrown at it so far wonderfully. I chose this over the Mill/Drill because the simpler it is, the longer things seem to last. So far there has not been a a part of the machine that makes me feel like it's cheaply made. The tilting head seems to work very well, and stays in position. I'll be sure to change this is this machine becomes an under performer, but so far so good. I also decided to get the 4" rotatory stage too! 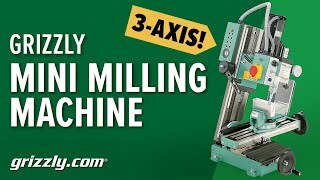 This milling machine is outstanding! Exceptional quality in a compact package. Service was excellent, it is a great product, and delivery worked like a fine clock!